This Machine is suitable for various kinds of packages of diapers, disposal under-pads, sanitary napkins, paper napkins etc. Packing , sealing and cutting all could done in one set of machine. PLC computer control system .Technical parameters could be read from LCD(liquid crystal display) screen, which made parameter setting and controlling more accurately.. our machine assure them longer service life and more accurately controlling& positioning. Same machine’s same discharge port can package products with different specifications, both single row and double-row could be realized, our machine can be adjusted freely , meanwhile customers will feel easy and convenient adjusting our machine. 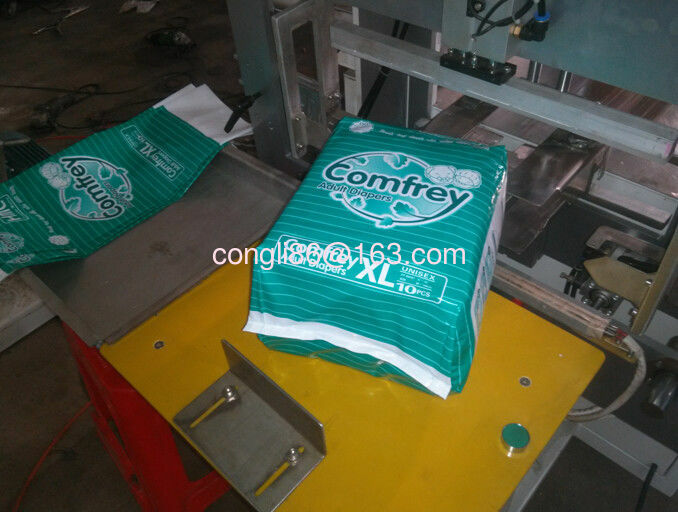 Packaging speed:8-15bags ∕minute. Machine holds rational structure, stable property, everlasting material, main controlling spare parts adopts high-quality imported brands, and others all belonging to national standard high-quality spare parts.